All Contents © 2017 New England Runner. All Rights Reserved. The contents of all material available on this Internet site are copyrighted by New England Runner unless otherwise indicated. 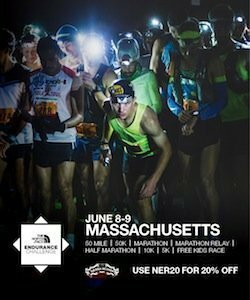 All rights are reserved by New England Runner, and content may not be reproduced, downloaded, disseminated, published, or transferred in any form or by any means, except with the prior written permission of New England Runner, or as indicated below. Readers may download pages or other content for their own use, consistent with the mission and purpose of New England Runner. However, no part of such content may be otherwise or subsequently reproduced, downloaded, disseminated, published, or transferred, in any form or by any means, except with the prior written permission of, and with express attribution to New England Runner. Copyright infringement is a violation of federal law subject to criminal and civil penalties. The technical information contained herein is provided to New England Runner by New England runner and outside contributors. While New England Runner makes every effort to present accurate and reliable information on this Internet site, New England Runner does not endorse, approve, or certify such information, nor does it guarantee the accuracy, completeness, efficacy, timeliness, or correct sequencing of such information. Use of such information is voluntary, and reliance on it should only be undertaken after and independent review of its accuracy, completeness, efficacy, and timeliness. Reference herein to any specific commercial product, process, or service mark, manufacturer, or otherwise does not constitute or imply endorsement, recommendation or favoring by New England Runner. New England Runner (including its employess and agents) assumes no responsibility for consequences resulting from the use of the information herein, or from use of the information obtained at linked Internet addresses, or in any respect for the content of such information, including (but not limited to) errors or omissions, the accuracy or reasonableness of factual or scientific assumptions, studies or conclusions, the defamatory nature of statements, ownership of copyright or other intellectual property rights, and the violation of property, privacy, or personal rights of others. New England Runner is not responsible for, and expressly disclaims all liability for, damages of any kind arising out of use, reference to, or reliance on such information. No guarantees or warranties, including (but not limited to) any express or implied warranties of merchantability or fitness for a particular use or purpose, are made by New England Runner with respect to such information. At certain places on this New England Runner Internet site, live ‘links’ to other Internet addresses can be accessed. Such external Internet addresses contain information created, published, maintained, or otherwise posted by institutions or organizations independent of New England Runner. New England Runner does not endorse, approve, certify, or control these external Internet addresses and does not guarantee the accuracy, completeness, efficacy, timeliness, or correct sequencing of information located at such addresses. Use of any information obtained from such addresses is voluntary, and reliance on it should only be undertaken after an independent review of its accuracy, completeness, efficacy, and timeliness. Reference therein to any specific commercial product, process, or service by trade name, trademark, service mark, manufacturer, or otherwise does not constitute or imply endorsement, recommendation, or favoring by New England Runner.